so many remarkable cookers. I have been fortunate to make a lot of new friends and renewed old friendships as well. a member of the barbecue team, Futura Viking Tallinn. This 4-person team was comprised of the master cook, Oleg Alasi and his wife, and Rein and his wife. All his life, Rein developed electronics, hardware, and various software. As this team came to San Diego, all they had on the plane with them was metal fireplaces and hand tools. 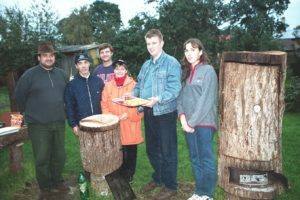 They were promised soft, big tree logs so they could make their Wooden Oven Cookers at the contest. Instead, oak logs, one of the hardest woods found, were delivered. Their hand tools could not handle the hardwood; therefore, they had to rent saws and other tools to hollow out the three wood logs to make their cookers. They spent two days just making their cookers. Some of the barbecue cooking teams helped them out, putting all their resources together to help Rein and his team for the competition. Danny, James and Lola Rice and others shopped for tents, knives, and other necessary items. After all was done for them, the Futura Viking Tallinn team inserted their metal fireplaces and cooking racks. Rein said the high point in his life was that their team won 2nd in beef, 5th in seafood and 8th overall. This certainly shows the hospitality and the willingness to help each other in times of need. Rein mentioned that before this completion, he was very successful in his barbecue endeavors locally and was a judge. So Rein has seen both sides of barbecue competition. 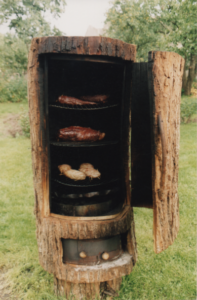 Rein Ruus is the innovator of the wooden BBQ smoker! 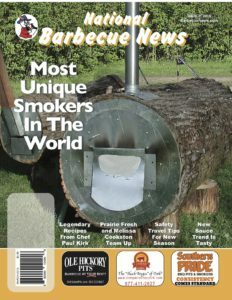 In 2004, I, along with Jeremy Fowler, Wayne and Maria Lohman, and Mike Thompson were invited by Jaan Habicht, the organizer to judge the 9th European Barbecue Championship in Estonia. I had the pleasure of revisiting Rein Ruus with the cooking team, Soprus Futura Viking. This was the same team that was featured on the front of the National Barbecue News at the 2002 WBQA contest in California. I was very interested in just how he made grills from wood. They took an 8 ft. long log, about 3 ft. in diameter and hollowed out the center with hand tools. Then they placed a metal cooking chamber inside, complete with an intake and exhaust, and a temperature gauge. 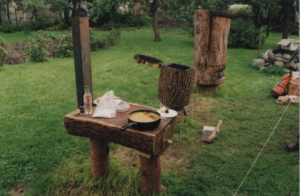 They also used various sizes of wood to make vertical and horizontal wooden cookers. Jeremy Fowler and I enjoyed tasting the ribs from one of Rein’s cookers. If I get Rein to give me the instructions on how he creates his log cookers, I would have one on my farm! I also visited the German team led by Hans Fuch, who was given the title of Mr. World Barbeque. I sampled some of their beef tenderloins and it was some of the best I have ever tasted. We spent our last evening at the famous 11th Century building called Old Hansa, which was located inside the old walled city of Tallinn, Estonia. Nine courses of food were available. We all agreed this was some of the best food we had on this trip. cooker, it is hard to hold the temperature. However, by staying by the cooker and monitoring the temperature, it works well. Rein also prefers to use alder or apple wood for flavor. As of now, Rein does not have any Wooden BBQ cookers. In their long wet, climate, the cookers do not last long. Plus it is hard to find good, big trees to hollow out to make his oven. right clearances, foil protection, and to hold the wood wet. By holding the wood wet, it removes the need for a water pan inside the oven. As you see, to use the BBQ Oven is a big task. Rein also says smoke heats the inside room. With no chimney, the smoke will go out from the doors and windows. First, you make the fire, and when the wood inside the oven burns, you remove the coals and ashes. This also ventilates the rooms. Smoke also sterilizes the rooms. Smoked saunas are normally found in Baltic countries, such as Estonia, Latvia, and Lithuania and found in Fin- land. As a side note, Rein enjoys cooking for his family every day. He enjoys old cars and has several he is working on now. 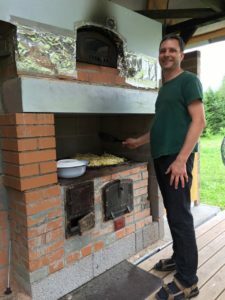 I have admired Rein’s innovation with the Wooden BBQ cookers and Smoke Saunas all these years. He tells me that his first tree for his oven was a poplar near his grandfather’s home. The tree was big and dangerous to the house. Yet Rein found a use for the tree, a genuine way to repurpose nature’s offerings.